A place reserved only for the most demanding palates. Harry’s Prime Steakhouse & Raw Bar is a highly-stylized concept specially designed for our most rigorous and detail-focused guests. With a clear emphasis on quality and through a carefully curated assortment of USDA Prime certified meats exclusively sourced from the best Nebraska farms, the menu at Harry’s includes the best of our culinary offer. Worth highlighting is our selection of Wagyu Japanese and dry-aged steaks, which stand out for their intense flavor and tenderness. In addition, Harry’s offers quite an exclusive and well-stocked wine cellar, regionally renowned for its extensive variety and its high quality standards. At Harry’s you will witness how exclusivity & atmosphere can gracefully mingle, immersed in an environment that is clearly set apart by the talent of a staff who will surpass any expectations. My experience at this restaurant was absolutely beautiful. My family and I were there for our Thanksgiving Dinner. The atmosphere is perfect, right off the water with a view of the sunset and a dock we could walk out and get pictures with the sunset. The service and the food was phenomenal. Very nice location and the interior is nice and spacious...dark wood modern look. The menu has multiple options besides steak and the food was delicious. The staff was very knowledgable and attentive. We went twice during our stay. We had the most delicious beef ever at Harry’s. I could cut it with a fork. No need for a steak knife, for sure. Service was amazing and very friendly. We visited Cancun for a friend’s 40th birthday and we happened upon Harry’s our first night there for dinner. The combination of fantastic service, fun atmosphere, and amazing food brought us back for a second night during our four night stay. To start, the martinis suggested by our waiter, Johnny, were a hit! The music was just loud enough with lots of fun songs - we even asked how to get the play list. The seafood tower was perfect to split between a group of girls. They top off your dinner with a huge cotton candy pole - sounds weird but we are very bite, having not had cotton candy since we were kids!The view of the water tied it all together nicely. I would highly recommend Harry’s to anyone visiting Cancun. We have dined at this restaurant many times. I still can not speak higher of the quality of the food and the service. 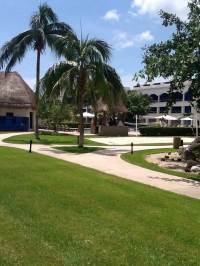 The atmosphere and setting is also one of the best in Cancun! This was a fantastic spot to meet with friends. The drinks were great, meals were delicious, (I️ had the lobster bisque) and the crowd was fun but not too old! I will definitely go back. While on company trip to Cancun we were suggested Harry's was a great choice.Glad we took their advice. Everything was outstanding. Was especially impressed with our wait staff. Armando and Mary treated us like we were family returning after a longstay away. I don't know how we could have asked for more! Good food, Great serviceVery friendly and knowledgeable. What more can I say. Do yourself a favor and addHarry's to your must see in Cancun. Ask for Armando! This place satisfied my half Asian half American stomach. Make sure to try the grilled fish if spicy is your cure, and/or the tequila shrimp with a bit exhibition. Servers are the best - very much enjoyed. Dinner $50+ pp plus drink. Choices of steaks from Grand Island, Nebraska ranged from 8 oz. to 30 oz. - Cooked to perfection in a beautiful setting. Our outstanding main server was Jose’ Luis, as was Javier, his assistant. They both answered our every desire! We split a wedge salad thankfully, because the portion was large! While I had a 14 oz. rib eye, my husband had the 20 oz. bone-in rib eye, and both were excellent. Just as the other reviews, Fine Dining at its best! From the ambience to the service, we found Harry's to be the best for steaks! We are from the Chicago area, home to many fine steakhouses, thus we are very particular. My chief complaint about steak in Cancun is that many are advertised as “prime,” but in fact are inferior cuts that have been chemically or mechanically tenderized. Harry’s cowboy cut steak was excellent —appears to be choice or prime, dry aged, and cooked to perfection au natural! The house Brioche and various flat breads, served with 5 different sauces ranging from mild to hot in intensity, all interesting and very good. Shared Harry’s Oysters appetizer, which is similar to Rockefeller, also very good, although the oysters were small. Sides were wonderful, the sautéed mushrooms with white wine was the standout. Finally the “selection of desserts” was exceptional: chocolate fondant Bombe cake with an outrageous filling, tiramisu served in a mini coffee cup, and the most delicious carrot cake I have ever tasted being the highlights. I use Open Table for reviewing restaurants, and rarely do I write a 5 star reviews; most dining experiences are in the “good” or “very good” category imo, but Harry’s earned this 5 star review. Nayson and Juan Carlo took extra excellent care of us with only a reasonable wait between courses. Very attentive and detailed waiters. Our truffle oil mashed potatoes were on the cooler side but that was taken care of promptly. I’ll be back! Booked a table for 5 of us to celebrate my engagement, the staff couldn't have been more accommodating, fantastic service nothing was too much trouble. The food was absolutely delicious. Steaks cooked to perfection. Amazing appetisers to begin, lots of lovely breads. Wine was lovely. Can't fault this place at all. Can't wait to go back! Thank you for a lovely evening! Just the best ! Delicious food, great ambience and excellent service, made for a pleasant dining experience. My wife and I loved the Chocolate Martini's and Brady is a great bartender!!! Can't wait to come back!!! I am a tough critic of steak houses coming from NYC, but the food and steak is top notch. One of the best steaks I have ever had! We loved this meal from start to finish. Stunning atmosphere, amazing service from Elio and Gener, and delicious food! It’s a must visit if you are in the area. We are visiting Cancun after 20 years and heard a great deal about Harry's. It's all true. We had an amazing meal. The sauces that arrived with the homemade bread are unique each with its own distinct flavor. The setting is gorgeous, along the lagoon. My husband is an accomplished griller; it's hard to beat his steaks, but Harry's did. We had the tomahawk ribeye and it was cooked to perfection! Even my husband conceded, this was better than his. Jorge and Victor served us with kindness and professionalism. Yes, it's a pricey restaurant, but definitely worth it! We had an amazing dinner at Harry’s! Daniel and Ignacio went out of their way to give us the most amazing dinner experience! The food was devine as was the restaurant. We loved every moment of our experience and would recommend Harry’s to all of our friends! 5 stars! We had so much fun celebrating our one year wedding anniversary at Harry's! The staff went out of their way to impress our guests. The display of meat at the table is beautiful and unique. Also when you order a bottle of wine they pour it in your glass from the most beautiful decanter from across the table! Great food & service! We visited Harry’s on our last night in Cancun & were so glad we choose this restaurant. Hubby needed a steak fix. His steak was excellent “one of the best he has ever had” (and he eats a lot!! )I had the lobster ravioli which was also delicious. We forwent appetizers as we generally then lack an appetite for our entrees, but enjoyed the warm bread.The wine was excellent and the service of it beautiful. The best decanter I have seen!! Lovely big robust glasses for our Cab Sav.My cucumber martini was one of the best I have had in my travels!The service, setting & ambience was all exemplary. Yes, it was a little pricey but the quality of everything made it a special ‘experience’.The candy floss dessert they bring you seems to be a big hit with many diners. We hate candy floss so ours just sat on the table & we watched it melt. Note: they should maybe ask if you want it, not just take it that everyone will!I would definitely visit Harry’s again!! Although we stay at an all-inclusive resort Secrets The Vine we always spend one night at Harrys.The food there is out of this world, the steaks are to die for.Also make sure you try the Coconut Martini, I even asked for the recipe.Lastly do not forgot to leave room for the candy floss. Incredible food, lovely service, and a beautiful restaurant. White tablecloth dining on the water! This is definitely a destination worth trying. We enjoyed our evening, from empanadas to the surprising cotton candy! Our beef was excellent as was the spinach. Portions were large and very well prepared. The service was outstanding and the view from the patio was stunning. Music was a bit too loud. 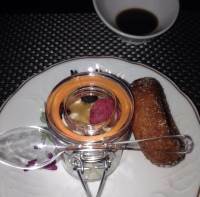 We went to Harry's one evening as a recommendation by the Ritz Carlton. We were seated outside on back patio facing the bay. The views were spectacular. The service was outstanding and the food was really good. Being from New York and working in the city we have a lot of experience eating in well renown stake houses. Harry's def ranks up there with NYC stakes houses. Best steaks in Quintana Roo! Expensive. Always outstanding food and service. Very fine wine list! We spend 11 weeks each year on Riviera Maya, and never miss our trip to Harry's! I’ve eaten at Harry’s a number of times over the years and it’s never failed to deliver a fantastic meal. We had the 25 ounce Fillet steak and it was cooked to perfection. It’s not the cheapest that’s for sure, but it’s worth it for a special occasion. Best steak I’ve ever had!!! Went here for my birthday meal with my partner and it was the BEST! !Staff were extremely friendly and helpful and always there to provide prompt and efficient service. They brought over bread and crackers with dips/sauces for us to start. This was very yummy!! The also brought us fiji water which was kept chilled throughout the meal. We bought a bottle of red wine which was perfect, staff always filling our glasses up. We didn’t have a starter as wanted to enjoy our steak, which we definitely did!We shared the fillet mignon which was the tastiest steak we have ever had!!! It was very large but we managed to eat it all. It was cooked to perfection and our waiter kept making sure with us it was cooked as we requested. We shared 3 sides all of which were delicious.As it was my birthday, the waiter brought over a slice of very tasty chocolate cake with happy birthday on it and a sparkler. Very nice touch! !Very reasonable price too, around $145 for 2. Would definitely recommend this restaurant to anyone visiting Cancun!!!!! I had a great experience dining at this restaurant while staying at the Ritz across the street. This place is very trendy and you can tell it is popular with locals as well. The food was delicious and the service was great. I look forward to coming again on my next trip! We had GREAT food, friendly staff, GREAT location (right on the water) and moderate pricing. I would highly recommend it to anyone. Great dinner ending to a wonderful honeymoon!! My wife and were hoping to go to a different restaurant but they were full. We very happy they were because we discovered Harry's. Great service. Great food. Great atmosphere! I just love this steak house, the best in Cancun. The portions are big so your best bet is to share. The Rock shrimp appetizer is just delicious. Shared the 25 oz. filet with two other people and was more than enough. Don't miss this place on your trip to Cancun. I went to Harry's with my wife and had a wonderful experience. I got the filet mignon and the Caribbean Lobster. The only reason I did not give it 5 stars is because I think they mixed up the steaks and gave me my wife's steak she ordered hers well done I ordered mine medium. Other wise everything was outrageous good . My wife said the chocolate martini was to die for. I had the creme brulee and it was superb. At the of the meal they bring a giant thing of cotton candy which is awesome. It is a little pricey but worth every penny. Service was outstanding. We've been to Harry's 3 times now. The first 2 were awesome but a few weeks ago when we were back, several of us felt that the quality of their steaks was not as high as it used to be. Several of the steaks our group had were tough. The service is still excellent though and the sunset is awesome. We'll probably try another steakhouse in Cancun next time. We were a large group but were treated with excellent waiter service and delicious food. Both steaks and seafood were good. Sides are sharable and enjoyed by all. The wine list has something for everyone. And if you are ordering the key lime pie - it is large enough to share with your friends! And as always there is the towering cotton candy to end the meal. Great steakhouse in the hotel area of Cancun. Too many visits here but this time the food was above level. Service is amazing, even if the place is empty or busy it's always consistent. Good ambiance, great view, great atmosphere and quality service is the best of the three restaurants together! !Much better Harrys Cancun than Mexico City ! !Can't wait to go back. Restaurante decor is nice, mojito was very good and that is it. Appetizer of crumpled duck was tasteless. Same for the linguini with pesto and the other linguini my wife ordered. Nothing special. Just okay. View was amazing, food was OK, but way to pricey. Atmosphere was great too, especially the bathroom, had an atrium. incredible view. Worth the expensive tab just to enjoy the sunset. Mosquitos can be an issue. Service was great, food was vey expensive, quality was good , but a bit overpriced. You pay for the view. 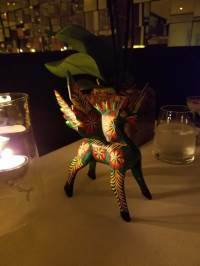 I didn't write a review after my average experience at Harry's in Mexico City. I thought it was an off night. Now having visited the Harry's in Cancun, and having a similar experience, I've concluded that Harry's doesn't stand up to all the positive comments I've read.The decor is excellent. The lighting, color scheme, wood tables, waiter uniforms and overall feel are all well done. And service is good (with a few exceptions - like clearing dirty glasses with fingers inside the bowl of the glass).It's the food that continues to disappoint. My Kansas City was overcooked, tougher than I'd like and lacking that meatiness. The cream Spinach did not taste like spinach and was not creamy at all. The Jalapeno Mashed Potatoes didn't taste like potato or jalapeno.The red wine by the glass was served a little too warm for my taste too.I really want to like this place, but the food has to deliver more quality first. I actually just got back to my hotel room at the JW Marriot and I can’t even begin to describe how upset I am. We are here on vacation for my wife’s birthday and the experience at this restaurant was horrible. We sat down at 7:40 ordered our food a few minutes later. They forgot my wife’s appetizer and after an hour our main course still had not arrived. Not one person came over to update us and I want to thank Oscar our waiter for being completely unresponsive to us. After I finally told someone in charge we had enough they said give us five minutes which I told them no chance. We are now sitting in our hotel room waiting for room service. Thank you Harry’s for screwing up my wife’s birthday. Harry's (and Fred's) CONTINUE to be overpriced and catering too much to wealthy locals. Why pay US prices anyway in Cancun? And have their management care less about how you feel? Might as well go to Ruth's Chris just up the street. I continue to be annoyed at this arrogant restaurant. If you go, beware and be forewarned. And bring a thick wallet.